Tuesday today and there's a Planet Nomads blog post... what's up with that, you ask? Well, big things happening in the past 6 days since we launched the closed-alpha of Planet Nomads, and now that we've managed to get keys to all Alpha Kickstarter/PayPal backers, it is time to get you the status report. Planet Nomads had one shot at making the first impression and going through the Youtube videos on our sandbox game, we can safely say it hit the mark. We'd like to thank all Youtubers who provided an accurate peak into Planet Nomads Alpha and helped spread the word. We've been chatting on streams and let us assure you it's unbelievably heart-warming to see people recognize Planet Nomads in the chat there and see familiar names. There were over 2000 Alpha-Tier backers prior to Alpha release on Thursday and over 250 more have joined since the release. People still considering the alpha access have 2 more days left till the alpha-tier closes for good. Not only have we seen people play Planet Nomads, which is tremendously helpful in figuring out what works and what doesn't, but the Bug Reports on the forum are detailed and contain all the information for us to reproduce and fix the bugs. Besides that, people have been helping each other out with hot-fixes, and the Linux players even provided ready-made solutions to our devs, how bloody cool is that? We've seen detailed creations, faster-than-light travel, we've seen good things and we've seen funny and not so funny glitches... and all that is good. We see people are playing the game, and there's hardly a better view for a game developer (or any creator really) than to see his creation being lived and experienced. We have collected bugs on the forum, have fixed a few already (beacons switching off on their own, memory leaks, stacking of arced blocks and perma-strafing to name a few) and there are more we are working on right now. You can see the complete list of acknowledged bugs on the forum. The first update of the Alpha version is coming next week and it will include fixes of the above mentioned bugs. A complete list of bugs will be covered in the changelog next week. 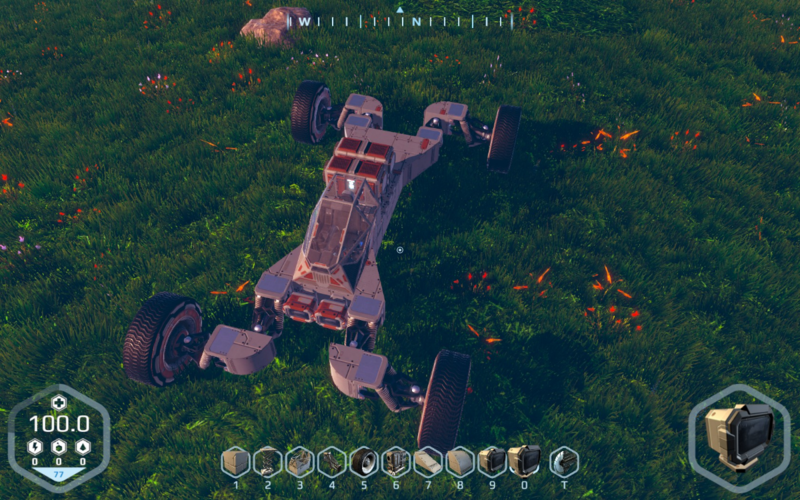 We are incredibly happy to announce that the most pressing issues with physics, like "skidding" vehicles, bouncing and "wobbling", lights screwing up suspensions and the rotor blocks/hinges not always on their best behavior, will be greatly improved. And by greatly we mean nearly entirely. This is a huge win for Planet Nomads, since we have been tinkering with physics in the past several months going from stable, to sometimes wacky, to massively screwed by lights, all the time trying different settings, block weights, wheel power, suspension toughness and banging the table. It seems we have find the perfect combination of them. We'll see next week when you get your hands on it. To our big surprise, we've seen complaints about how stable the alpha version is. We suppose it was surprising to some people, in today's era of Early Access games. Call us old-fashioned, but this is how we approach game development. Again we wanted Planet Nomads to make a good impression, but that's not the main issue. The thing with hacking together lots of features for the sake of having them and promising yourself to polish them and make them work as intended later down the road is that this approach usually doesn't work. The code gets complex, any retroactive changes affect things you wouldn't expect them to and when the nightmare starts, it never ends. Martin D., the spiritual father of our Sandy engine, has experienced this the most with the Android version of Overkill 2 and I'm sure he never wants to go through that again. We are in for the long run with Planet Nomads. So when we are working on it six months or a year from now, growing the game, we can still be as effective as we have been so far, and the game will perform as expected. In the long run, it should make us all happy. Besides the update/patch next week, we will also have a looong meeting planned for the next week, where we'll talk about the next couple of months leading to Early Access and what changes the alpha testing has hinted at and which we are going to utilize. We are hoping to be able to answer your questions about the future in more detail. So once more, hang in there. Now that the alpha milestone is behind us, it is time to upgrade Planet Nomads to Unity 5.4. Cenda has been selected to be the first to test PN in 5.4 and has brought back good news, errors are but a few. Once the whole team and PN project migrates to 5.4, we'll start exploring the newly added features, like texture arrays that should get rid of the visible grid you may have noticed on the terrain. So this is the news, delivered as soon as we could. As was mentioned, there is still a chance to get on board the alpha. Afterwards it closes for good, and the next path for Planet Nomads begins - to have the Early Access version, publicly available to all, which will include survival mode with mining, crafting and wildlife fighting.